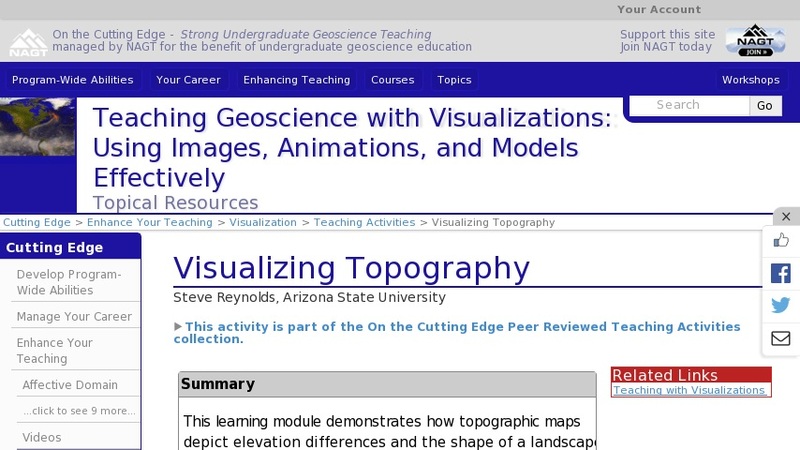 This learning module demonstrates how topographic maps depict elevation differences and the shape of a landscape by utilizing 3-D visualizations. 2-D topographic maps are paired with 3-D visualizations of these maps, complete with interactive capabilities that allow the learner to rotate or tilt the visualization in order to gain different perspectives. Other animated features include sequential vertical slicing of a topographic cube and flooding of 3-D rendered surfaces. The goal is for the student to be able to read this type of map and easily recognize the surface features the map represents. This module is a series of visualizations set within a lesson activity that leads the student on an exploration of how 2-D topographic maps depict the 3-D character of a landscape surface. The learner embarks on a guided tour of 3-D landscapes, yet sets the pace of the adventure and is free to move backward and forward on the journey. Features explained and depicted include contour lines, cliffs, hills, valleys, and profiles. This visualization is part of a curriculum developed by Steve Reynolds, geology professor at Arizona State University. His website contains a variety of 3-D perspectives, color photographs, and information regarding the Geology of Arizona, Landscapes of the Southwest, structural geology, and science-education reform.